Yakisoba (stir-fry noodles) is such a casual tasty dish which almost everybody in Japan loves. While there are so many variations of yakisoba, my all time favorite is the simple oyster sauce flavor with pork and cabbage. This yakisoba makes me feel nostalgic, as it’s similar to what my mom used to make for a quick lunch when I was a child. 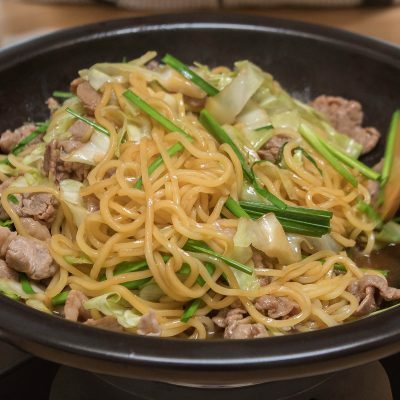 With the tagine-style donabe, Fukkura-san, the ingredients are steam-fried and the noodles have such a nice bouncy texture, while the meat and cabbage get lightly caramelized. 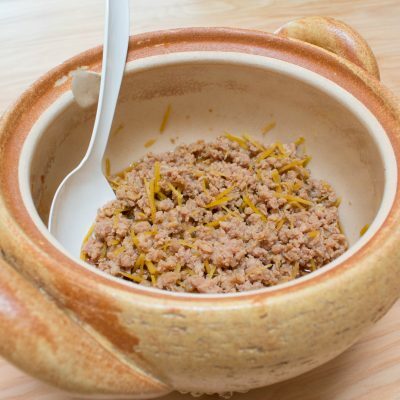 Instead of typical karashi (Japanese hot mustard), I like serving this dish with Kanzuri. As a variation, you can substitute soy sauce with Smoked Soy Sauce for a nice smokey and robust nuance. 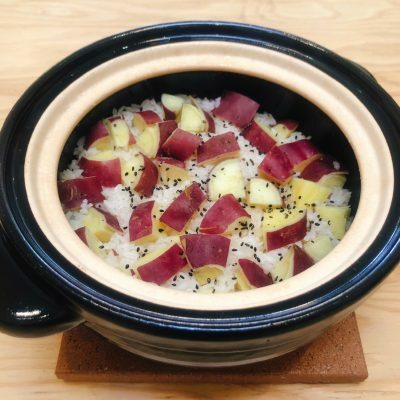 This is one of my favorite fall-to-winter rice dishes since I was a child. This is such a simple dish, as the main ingredients are just the rice and satsuma-imo (Japanese sweet potato), and they are seasoned very lightly only with salt. The natural sweetness of the satsuma-imo is fully brought out after cooked with the rice, and the texture is nicely soft to work great with the shiny chewy rice. I also love making onigiri (rice balls) with this dish. They taste great hot or room temperature. If you want to add more flavor, you can cook the rice with dashi or even consommé works nicely, too. Simple, quick, and satisfying, beef and tofu stew is a popular home dish in Japan. 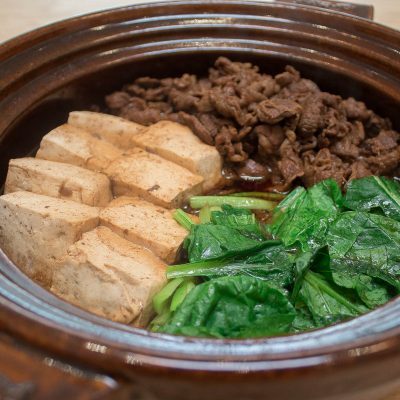 With an addition of komatsuna (Japanese spinach – you can substitute with regular spinach or other leafy greens), it makes a nutritiously balanced one-pot dish. I love using Tamari Soy Sauce for seasoning, as it gives a nice deep flavor, but you can also make it with regular soy sauce and it will still taste great. If you have any leftovers, I highly suggest you reheat it in a donabe (or a small pot), drizzle some whisked egg over it, then once the egg is at your desired consistency, pour the whole thing over the rice to make a beef and tofu rice bowl. Just so that I will have enough leftover the next day, I tend to make extra amounts of this dish. This dish is something I like to whip up especially on a busy day. While marinating the salmon in shio-koji, I I can prepare all the other ingredients, then just pile them up and let the donabe do all the work. I love the slightly caramelized sweet potato in the bottom, while the salmon is perfectly cooked medium-rare (or you can cook it longer if you like the salmon to be well-done). 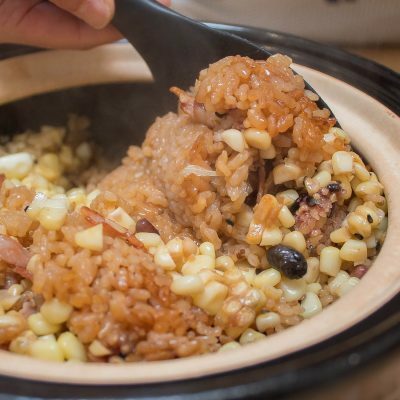 Here’s another version of my corn rice; this one has a big, bold flavor with the addition of rendered bacon, Smoked Soy Sauce, and butter. This is a great dish to serve at a summer party, too. When I made this dish at an outdoor BBQ dinner one day, everybody went crazy and it was gone so quickly! Corn is so sweet and savory at the same time, with its nice smokey and nutty flavor. 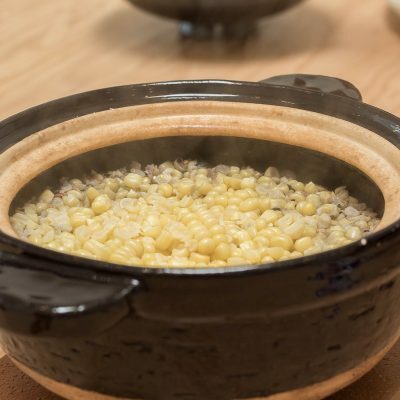 Although this addition is highly recommended, if you would like to omit the 16 Multi Mixed Grains, you can reduce the amount of the dashi by a tablespoon or so. 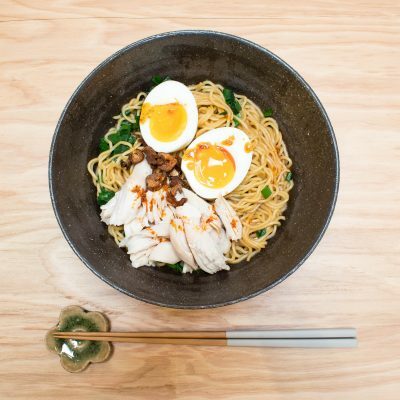 Cold ramen noodles with simmering hot and spicy broth with toppings create a wonderful dish to enjoy in the summer or all year round. The dipping broth is especially rich as it’s seasoned with hatcho miso (very dark miso made of 100% soybeans) with tamari soy sauce. But, if you don’t have either, you can simply substitute with quality red miso and dark soy sauce respectively and it would still be very tasty. You can also serve the broth cold, and it will be so refreshing and perfect to enjoy on a hot day. 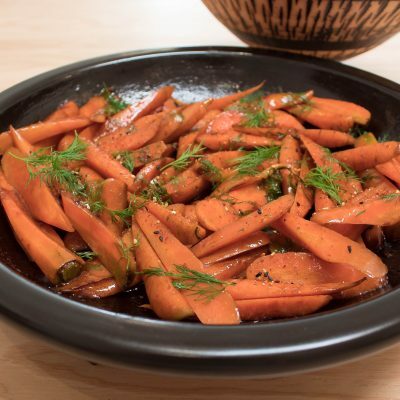 This simple dish brings the wonderful natural sweet flavor of the carrot with the umami nuance from the oyster sauce and mayo. I also love the hint of nutty sesame aroma coming from the Golden Sesame Oil. I can make this dish so easily and it always feels like a treat. 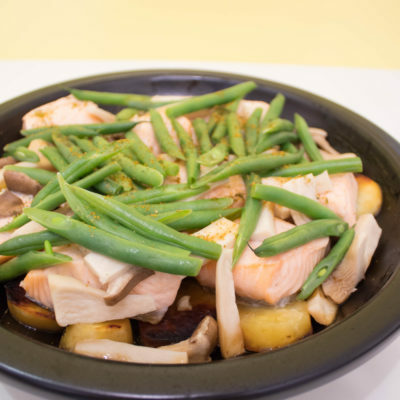 This dish is great either hot, right when it’s cooked, or at a room temperature. So, you can bring it to a picnic, too. During the spring time when the English peas are in season, I make this dish often. The shelled fresh peas are added to the donabe after turning off the heat and cooked only with the carryover heat. When the dish is ready, the peas are nicely cooked through while they bring the beautiful fresh sweet aroma and retain the beautiful color and texture. 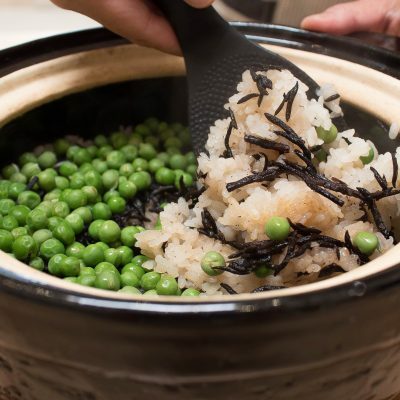 This dish is also great for onigiri (rice balls) to take to picnic, as it tastes delicious at a room temperature, too. 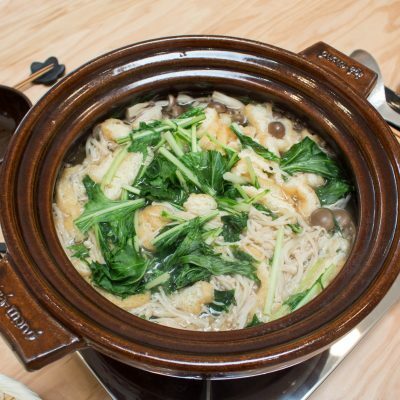 This dish is my unique donabe version of popular Japanese dish, buri daikon (simmered yellowtail and daikon in soy based broth). Daikon is first sautéed in butter, then, once the yellowtail is added along with the lemon and mushrooms, they were steamed with sake and Ayu Fish Sauce. All made in one donabe, and this versatile Fukkura-san donabe effectively steam-fry the ingredients. The result is so aromatic, savory, and delicious. 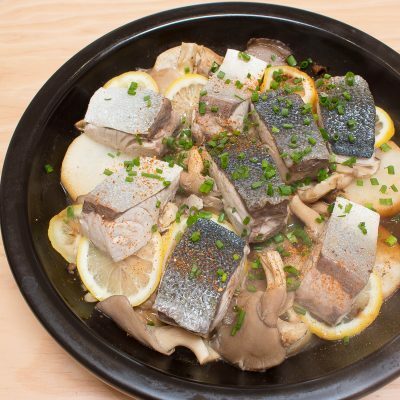 If yellowtail is not available, this dish can be made with other rich-flavor fish such as cod or sea bass. Ayu fish sauce gives the elegantly rich umami flavor, but it can be substituted with regular soy sauce, too. 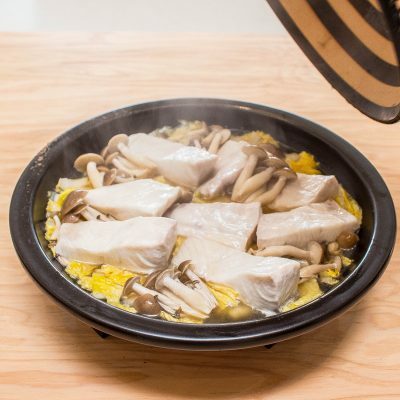 Simply assembled hiramasa (amberjack) with napa cabbage and shimeji mushrooms taste so pure and satisfying with the rich flavor of the dashi broth. The broth’s umami level is boosted with the addition of ayu fish sauce (I call this “magic essence”). Hiramasa can be substituted with yellowtail, sea bass, snapper, salmon, or any buttery fish filet. I like to serve this dish with plain donabe rice (white or brown). 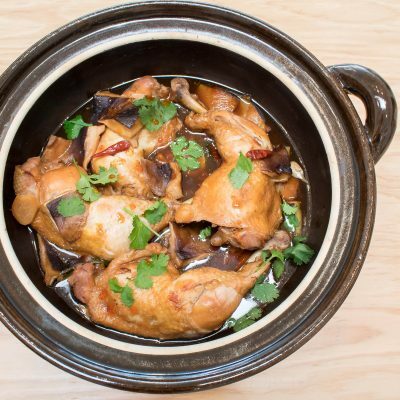 The main ingredients of this dish are just chicken and shiitake mushrooms, yet this dish can make such a hearty meal. The meat is so succulent and falls off the bone easily even with chopsticks. The special black vinegar from Kyoto gives the umami-packed layer of flavors to this easy one-pot dish. 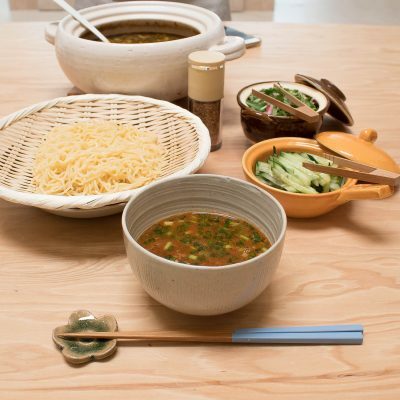 Making ramen is easy and fun, especially if you cook and serve as donabe hot pot right at the table. I like adding the chopped nira (garlic chives) to the ramen right before serving, but if you can’t find nira, you can substitute with thinly-sliced green onion and serve as a topping, instead. Enjoy with a couple of simple toppings or a make a platter of a wide selection of toppings to choose from for fun. Very popular among Japanese people of all ages, this juicy simmered ground chicken is cooked in simple seasonings of soy sauce, sake, mirin, and sugar, and is typically served over plain rice. When I was a teenager, this dish, tori soboro gohan, used to be one of my favorite items in the bento my mom made me to take to school for lunch. 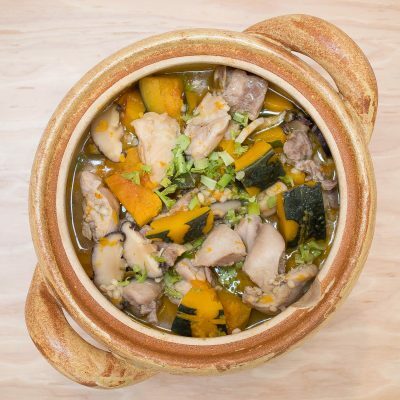 My version has the accent of a generous amount of shredded ginger to stimulate your appetite. I like to serve it with a very soft-boiled egg (with runny egg yolk) over freshly cooked donabe rice. You can also enjoy it as a topping for steamed kabocha, asparagus, or tofu. This simple vegan hot pot is so rich in flavor and satisfying. I like to slice the abura-age very thin, as these slices soak up the broth and taste like juicy noodles. If you don’t have access to abura-age, thinly-sliced tofu can work, too. 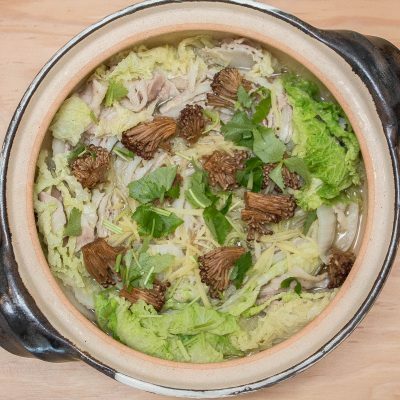 The key for the rich broth flavor is to add the mushrooms before heating up the kombu-soaked water, so the mushrooms release all the umami flavors during the slow heating process. For the shime (finishing course), I like to add udon noodles to the remaining broth, but soba is also good, too. Chicken wings and daikon are a classic combination in Japanese cooking. 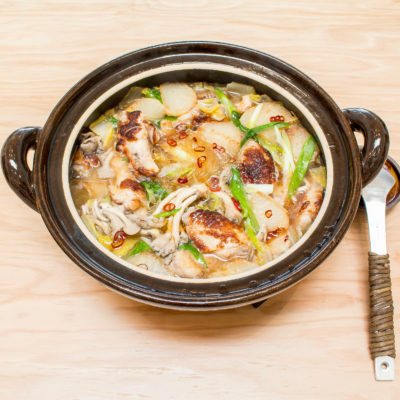 By pan-frying these ingredients before adding to the broth, the flavor of this simple dish enhances dramatically. Because the chicken is already marinated in shio-koji, this dish doesn’t require much more seasoning. Feel free to use fingers to savor the wings, as it’s part of the fun of this dish! 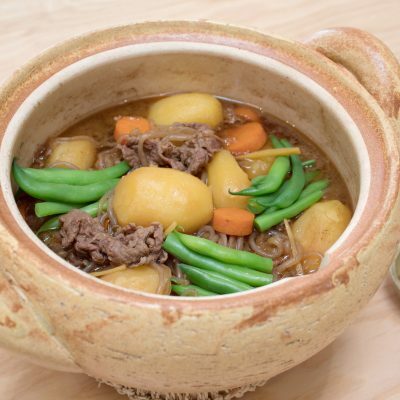 This hearty beef and potato stew is such a popular Japanese home dish among people from little kids to elders. While there are countless variations, for my nikujaga, I like to caramelize the onion before adding other ingredients. The onion gives nice rich layer of umami flavor to the dish. Miso-shiru Nabe always makes the perfect caramelized onion without having to constantly sauté it. I also add a lot of thinly sliced gingers for the accent.